So, I recently bought a Mi Box as my main kodi machine (review to come soon). Unfortunately, I made the “mistake” of upgrading it to Android Oreo a few days ago, through the official system update option. The update instantly broke Kodi for me, as Kodi then refused to access my external hard drive, on which all of my movies are stored. After making things worse (uninstalling/reinstalling kodi, deleting my entire library, and more), I started looking for help on the internet. It turns out the issue is widespread, with people on the kodi forums complaining that they are “Unable to access external hard disk after Oreo update on MiBox”, Others on reddit saying “Mibox with Oreo doesn’t recognize their external HDD”, or people describing “updated Mi Box to Oreo, and now I can’t use an external hard drive”. Kodi is unable to access external HDDs formatted in NTFS or ExFat, on a Xiami Mi Box running Oreo. When trying to access the disk, an error “path not found or invalid” will be returned by Kodi. The issue is specific to Kodi, on the Mi Box running the Oreo update. Other tools such as VLC, on the same box, don’t seem to have problems accessing the hard drive. The issue is specific to NTFS or ExFat hard drives. Hard drives formatted in Fat32 don’t have the problem. Some people have claimed that the issue could be with a NTFS or ExFat drive that has problems, such as being faulty, or not properly formatted. Given how widespread the issue seems to be, I believe these to be inaccurate guesses. The issue is real even if your drive has no issue. 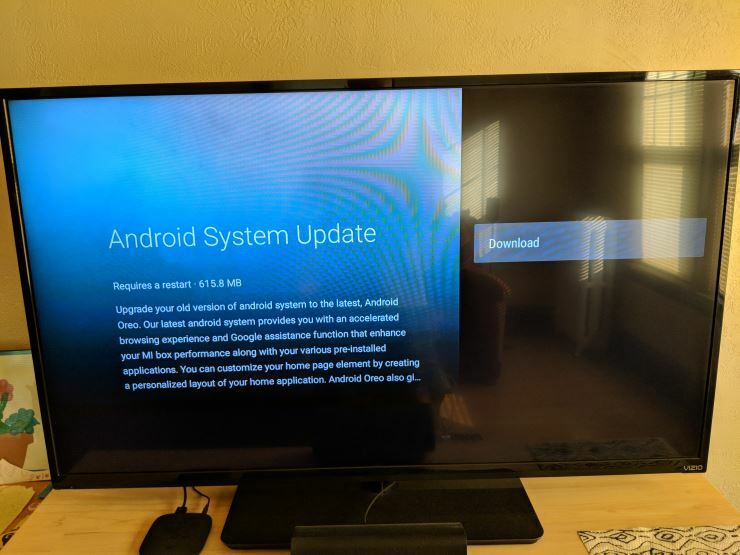 Some people have suggested that the MiBox Oreo update is crippled with bugs, and that the release is missing critical files that are necessary to the right behavior of NTFS/ExFat disks in Kodi. (specifically com.android.documentsui). There is no official fix for the issue yet, although it sounds likely that kodi might be able to find a workaround to the issue: since VLC and other tools work without a problem, it sounds like even without a fix from Xiaomi, there might be light at the end of the tunnel. But for now, no patch from kodi has surfaced in their nightly builds. There is also no way to downgrade the Mi box to the previous system update, so once you upgrade to Oreo, there is no going back. A handful of people have claimed on various forums that they had no issue using a NTFS External Hard Drive in Kodi on a Mi Box running Oreo. Sadly, to my knowledge, none of them have provided proof of this actually working. I basically found another hard drive I had lying around, and formatted it to FAT32. I then copied all of my videos from my NTFS Drive onto the Fat323 drive, and this is what I’ll be using for Kodi for now, until a patch is made available. For Windows users, formatting a hard drive in Fat32 can be a challenge as Windows restricts the size to 32GB. This is an artificial limitation though, as I believe Fat32 can theoretically support up to 16TB as far as I know. Free utility fat32 format helped me format my 500GB Hard Disk to Fat32. I believe that utility will format up to 2TB. For larger disks, your mileage might vary. It’s also important to mention that Fat32 has limitations in the size of individual files to 2GB. Because of that, some of your HD movies might not be able to be copied to Fat32. I lost quite a few of my own movies in the process, but I’ll survive (I still have a copy of them waiting on the NTFS drive). Bottom line is, this solution will work well if like me, you don’t care about 4K, and your HD movies are not “too” HD :). If you’re not too demanding on those aspects, switching to Fat32 will work for you. All of these are of course only workarounds and not a real solution. However I’m glad to say that my Kodi box is pretty much back to working state. I understand that to many of you none of the suggestions above will be perfect, but to me it was better to get our box back in a working state, rather than staying angry and eagerly waiting for an update from either Xiaomi (chances of it coming are very low) or Kodi (I’m sure a patch will come, but I don’t want to depend on it happening soon). On other issue that I haven’t figured out yet: The MiBox w/ Oreo can read NTFS drives w/ the above fix but still can’t read non-ascii file names from an NTFS drive! Hence, files with accent marks, for example, will not be recognized. Hopefully someone can come up with a solution. Note that the same exact program running on Nvidia Shield Oreo has no issue. Noob question: Where in Kodi do I do steps 1 & 2?